FreeWeather is basically free (limited to 100 requests per minute). customized layouts please contact us for a individual offer. add it to your website / application. FreeWeather offers different customizable weather panel templates. Due to the variety of settings options you can create quick and easy a customized weather layout. 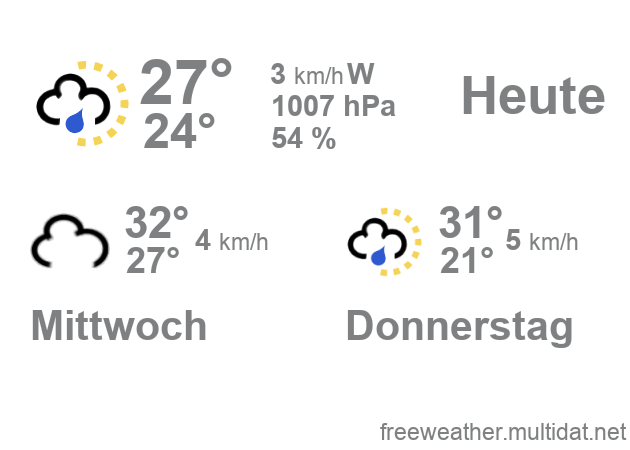 Beside the standard layouts, which are basically intended to be incorporated into websites, are there additional layouts like the weather icon. FreeWeather offers currently weather forecasts for 200.000 cities wordwide. The number of available weather stations can vary depeding on the available weather services. Please use the freeWeather support forum for further questions. Note: In order to change the weather panel configuration, you need to allow saving cookies. *1 Beside the shown configuration options you get many more configuration options (a.o. changing text and background color) after creating a freeWeather account.